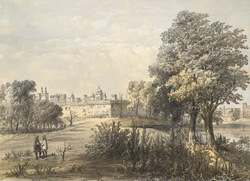 This lithograph is taken from plate 8 of 'General Views of Lucknow' by Sir DS Dodgson. The Chattar Manzil palaces in Lucknow are named after the chattris (umbrella-shaped pavilions) decorating their domes. The buildings are of the hybrid style that characterises much of Lucknow architecture and were built by successive Nawabs of Avadh. In 1837 Nawab Nasir-ud-din Haider died here when served ground glass in a goblet of sherbet. The complex once served as the United Service Club. The palaces were strongholds for Indian rebels during the uprising of 1857, and the British valued their capture. The high wall of the Chattar Manzil was destroyed in November of that year, and the British opened heavy batteries upon the Indians, before storming and capturing the Hern Khana, the Engine House and the King's Stables. When the British evacuated the Residency on 19 November, the route to freedom was via the Chattar Manzil, still subject to musketry fire.